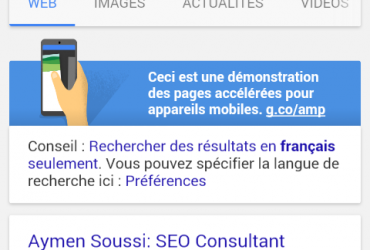 Selon un dernier sondage effectué en Janvier 2015, on a constaté que 67% du temps passé par les référenceurs (SEO Consultant) était consacré au référencement Local ( Local SEO). Afin de mieux vous évaluer, j’ai préparé un QUIZ comportant 40 questions. A la fin du Quiz vous auriez une note et les réponses à toutes les questions bien-sur. / Le QUIZ EST EN ANGLAIS – Car certains mots techniques ne sont malheureusement pas encore traduit en french! 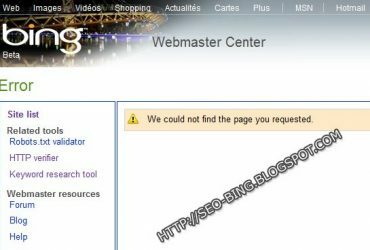 – Cliquez sur le lien ci-dessous, Bonne chance! Félicitation - vous avez complété QUIZ Référencement Local – Version Anglaise. 0-39% Débutant: Il est temps de commencer à bosser vos " citation data! " 60-74% Intermédiaire: Vous êtes proche du centre de gravité ! 75-85% Professionnel: Abordons la multi-localisation ! 86-100% Gourou: Chapeau bas! Je m'incline devant votre savoir! What does the acronym 'NAP' stand for? When a 'W' is added to the acronym NAP, what does the 'W' stand for? 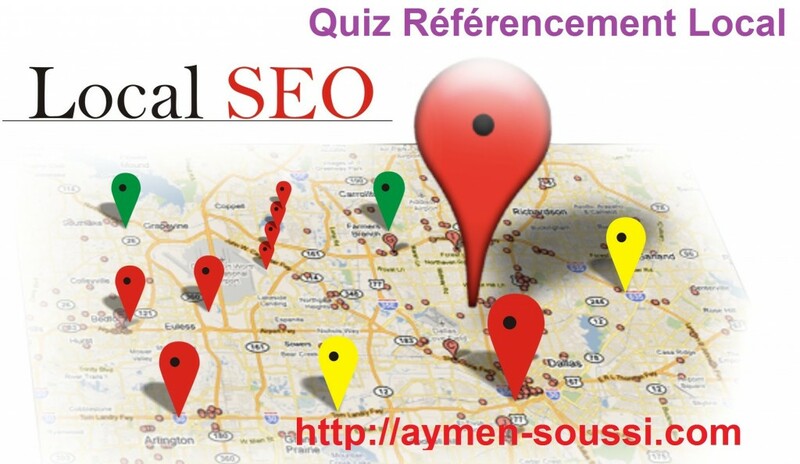 What is a citation in Local Search? A web-based reference to the partial or complete name, address and phone number of a business. A web-based reference to an error made by a local business. A penalty enforced by Google against local businesses that do not comply with the Google Places Quality Guidelines. A hyperlink pointing to a local business website. The number of citations earned by a local business. The authority of citations earned by a business from industry bloggers. Having identical NAP every place a business is listed across the web. Having duplicate content in the description field of you local business listings. Service area businesses, like plumbers, are allowed to create a Google+ Local page for each city they serve, even if they aren't physically located there. Rental properties are eligible for a Google+ Local page. Multi-partner businesses are sometimes eligible for multiple Google+ Local pages. Citations built by a paid third party service are inherently superior to citations built manually by an individual. Which of the following business models is likely to be ineligible for a Google+ Local page? Which of the following has long been considered a top factor in achieving high local rankings? Ensuring that a business has at least 25 Google-based reviews. Putting keywords in the business description field of the Google listing. Which of the following is widely considered to be a primary data source for major search engines in the USA? Which of the following would be considered a negative local search ranking factor? Which of the following would be considered a positive local search ranking factor? Taking the homepage content from the competitor sitting in the A spot in the local pack for your top keyword and pasting it onto your homepage. Having a physical address in the city of search. Ensuring that the NAP on your website has been hidden in Flash so that it can't be crawled. Moving the Google Maps place marker so that it looks like your brick-and-mortar business is located in the city centroid. Which of the following is true regarding the centroid concept in Local Search? If you aren't located within 1 mile of the city centroid, you cannot rank in Google's local pack of results. The centroid is founded on the popularity of a neighborhood within a given city, based on the number of times it has been mentioned on Facebook. Google appears to have unique industry centroids within a given city for different, specific industries. Proximity to the city centroid is the most important of all local search ranking factors. Reviews should be published directly by customers. Reviews should be taken down in writing by the business owner and then posted using the company's Google+ account. It's theorized that reviews may be filtered out based on the frequency with which they appear. Currently, customers must have a Google+ account in order to leave a Google-based review. Which of the following practices would you advocate to a local business client? Advertising on a classifieds website, offering to pay for reviews. Setting up several Google+ accounts so that the company can review itself. Getting a slow trickle of reviews, rather than lots of them all at once. Leaving negative reviews for competitors. Yelp encourages business owners to actively request reviews from their customers. It is good insurance against massive review loss to acquire reviews on a variety of review platforms. 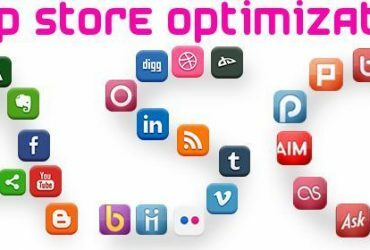 Which of the following website optimization practices would you endorse? Optimizing the footer of the website with all of the zip codes present in a 10 mile radius of the business' city of location. Ensuring that each title tag contains the business name at least three times. Building a separate website for each service offered by a single company, using the same local phone number on each mini site. Which of the following website optimization practices would you warn clients against? Building a unique page on the website for each physical office. Building a unique page on the website for each distinct service offered. Using several call tracking numbers on different pages of the site and putting them in crawlable text. A horizontal display of search engine results shown for some searches with a local intent. A derisive term used by local business owners who keep going in circles trying to get a Google+ Local issue resolved. Local knowledge graph results dedicated specifically to amusement parks. A horizontal display of the most prominent reviewers of a specific local business. Leaving negative reviews for competitors who are showing up in the 'people also search for' area of the graph. You cannot control what Google puts in this area of the graph. You can attempt to report inappropriate data, but you should probably move on to working on things you can control. Phoning Google via their contact options to report that you feel it is an unfair business practice to show competitors on your company's own knowledge panel. For a service area business (SAB) in a competitive niche, it's not typical to earn local pack rankings for service cities where the business has no physical presence. Which of the following sites might you see in the 'reviews from around the web' section of the Google+ Local page? For a brick-and-mortar business, there is no need to put any mention of its city of location on the website, because Google will automatically localize users results. Rate the negative impact on local pack rankings of Google discovering that you've listed a business at a false location. Rate the negative impact on local pack rankings of negative sentiment being present in Google based reviews. Rate the negative impact on local pack rankings of not participating in Google Adwords. Over the years, which of the following terms has not been used in the industry to refer to a Google Local product? Which of the following is no longer supported by Google? In some cases, Google offers phone support for its local products. Does Google display website design and SEO companies in their local packs of results? Which of the following has Google historically preferred as the primary number on Google+ Local pages? Which of the following is false about duplicate Google local business listings? Duplicate listings in multiple accounts are a violation of Google's guidelines. With the exception of multi-partner or multi-department business models, it's a violation to have more than one listing per business address in your account. Some duplicate listings are the result of automated activity on Google's part, not of actions taken by the business owner. Duplicate listings are no longer a violation of Google's guidelines. Il y a 40 questions à compléter. Débutant: Il est temps de commence à bosser vos " citation data! " Stagiaire: Vous êtes proche du centre de gravité ! Professionnel: Abordons la multi-localisation ! Gourou: Chapeau bas! Je m'incline devant votre savoir!